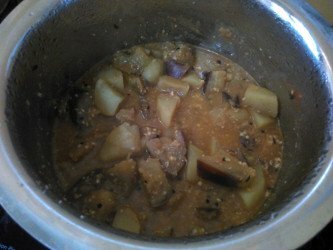 This Vangi babata rassa Potato eggplant aloo baingan curry recipe is a easy and fast cooking vegetable side dish. There are many eggplant recipes that can be served as side dishes but this is one of the easiest. 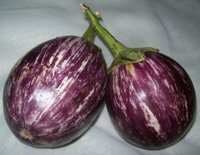 Eggplant is also known as aubergine, brinjal. In Indian languages, it is known as baingan(Hindi), badnekai(Kannada), katrikai(Tamil). You can serve it with chapati, paratha, naan or plain rice or jowar / bajra bhakri. This is a vegetable side dish with gravy. 'Rassa' means gravy. Make it as thick or thin as you want. 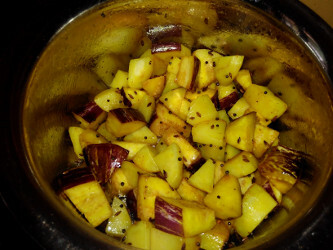 You may visit Eggplant Potato subji for a Maharashtrian style dry subji. Wash eggplants and potatoes well. Remove potato skins with a peeler or a knife. If you wish, you may leave the skins on. 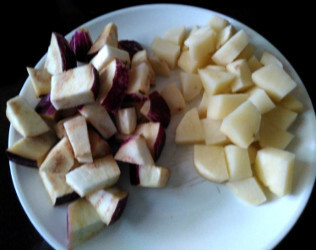 Cut eggplants/brinjals and potatoes in big pieces as shown below. Heat a pan and add vegetable oil that you normally use. I use filtered groundnut oil. 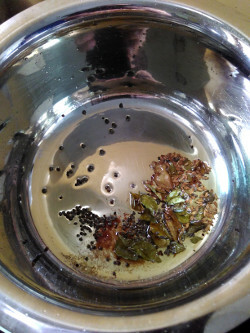 When oil is hot, add mustard seeds and cumin seeds. Let them crackle. Add potato pieces and eggplant pieces. Mix well with the tempering. Cover and let cook for 2 minutes. Add 1/2 cup water, cover and cook for 3-4 minutes. 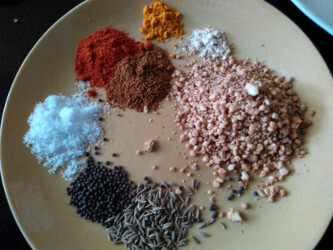 Add the chili powder, garam masala, jiggery or sugar and salt, groundnut powder, fresh grated coconut. Add more water if needed. 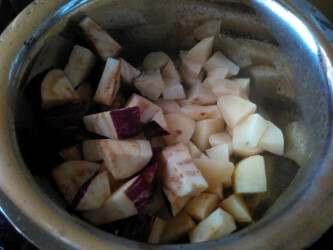 Cover and cook for 4-5 minutes or till potato and eggplants are cooked to your liking. Add coriander leaves. Mix well. Cover and let rest for five minutes or till serving time. I have removed the potato skins today. You may or may not remove the potato skins. I sometimes leave potato skins on.